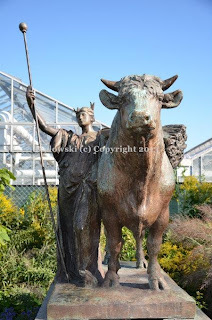 These two bronze works are based upon a pair of 12-foot-tall Bulls with Maidens that stood in front of the Agricultural Building of the 1893 World’s Columbian Exposition. One includes a maiden representing Ceres, the Roman goddess of grain and it symbolized the “Old World,” while the other maiden is understood as a Native American goddess of corn, symbolizing the “New World.” Also known as “Statues of Plenty,” the works draw upon a longstanding tradition in art of representing the harvest or bounty with female and animal forms. Potter, known for his depictions of animals, created the bulls and French provided the female figures. Several of the sculptural pieces from the Exposition were salvaged when the fair was dismantled, including smaller models of the Bulls with Maidens, and they were included in a 1908 exhibition at Humboldt Park. The public was so taken with the works that the West Park Commissioners decided to cast them in bronze in 1912. In 1915 these two works were placed at the entrance to the Garfield Park garden, facing Hamlin Avenue, and they remained there until the mid-1980s, when vandals stole one of the sculptures and badly damaged the other. In 2003, conservator Andrzej Dajnowski repaired the remaining sculpture and recast the missing one and they were installed in their current location near the Garfield Park Conservatory. In 2010, the missing sculpture was discovered in Virginia and returned to the Chicago Park District but it suffered a great deal of damage and remains in storage. At some point in the future it will be conserved and returned to Garfield Park.